Back on the road for this blupdate – I’d like to talk about some amazing places we visited in the much-maligned city of Buffalo, NY. The reputation of this city is quite similar to Detroit – a failing metropolis filled with architectural treasures that are at risk due to a lack of funding, and sometimes a lack of enthusiasm too. 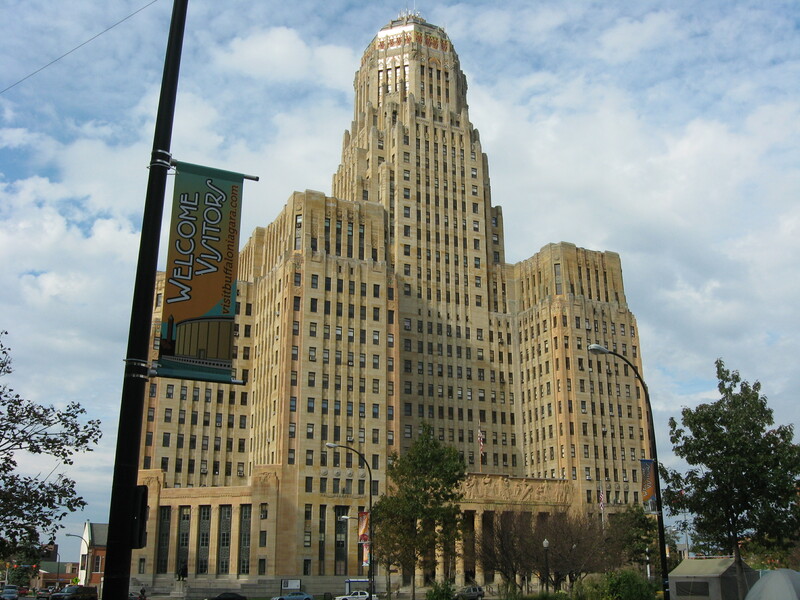 We just so happened to visit Buffalo at the same time as a National Trust convention was there, and we met some fascinating people who filled us in on the current predicament of the city. A huge number of houses (some empty, some not) are lost to fire each year, very little money is coming into the city; and yet is was one of the most remarkable places that we visited. We spent two days in the city, and I’m going to tell you about some of the food we ate, and the places we visited. 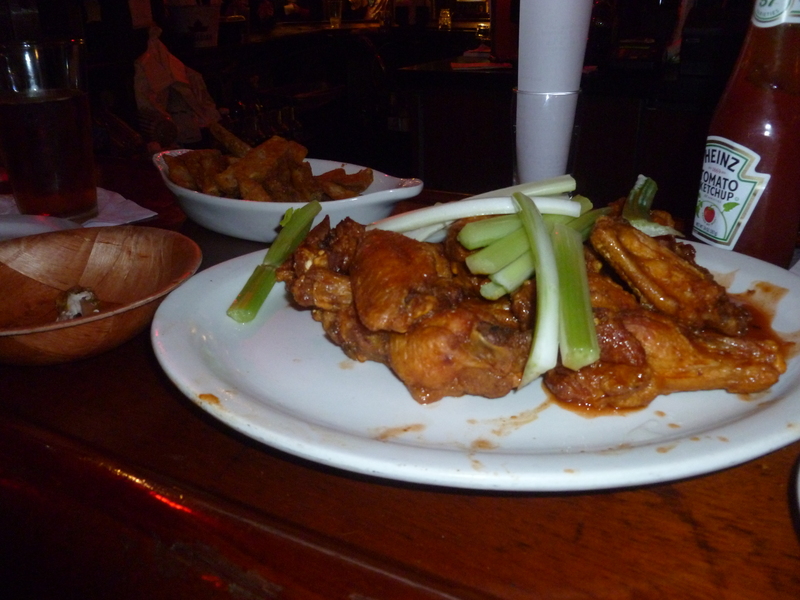 Above is not just a Buffalo legend, but an American legend: chicken wings from Frank & Teressa’s Anchor Bar. The story goes that they were created in 1964 by Teressa Bellissimo for ravenous friends on a whim, and they were so popular that people flocked to the restaurant to experience the new hot’n’spicy chicken sensation. 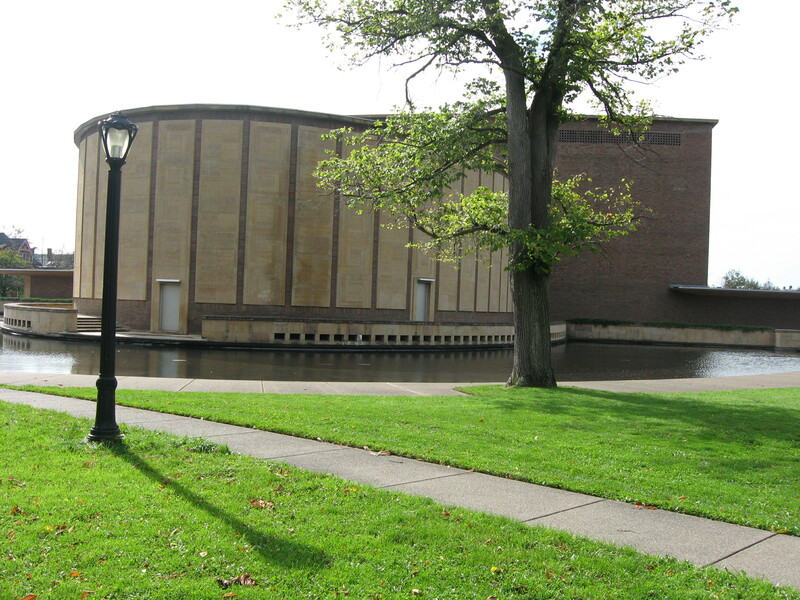 Now, my friend and I had had a long walk around Buffalo that day, taking in some of the architectural delights like the City Hall, and Eliel Saarinen’s Symphonic Hall (pictures below), so, after several beers and wines and beers again we ordered a plate of 20 medium spicy wings (a compromise between our palates). Even medium wings would be too strong for anyone averse to heat. I now understand the one use of celery – to cool down the mouth after eating Buffalo Chicken Wings! They also come with a dipping bleu (sic) cheese sauce. I never knew that spicy and blue cheese went well together, but it’s an explosion of awesome in your mouth. Inside the Anchor Bar itself we had a fantastic welcome, sat up at the bar and met some really nice people. The barman was kind enough to turn the TV nearest us to an ice hockey game (that was our thing), and we must have spent a very merry 5 or 6 hours in there before catching an overnight bus to Detroit. It was a fantastic experience, and I cannot wait to go back. Their funky website is here. The night before we went to the Anchor Bar, we trekked down to the Pearl Street Grill & Brewery, which seems to be expanding all over Buffalo at the moment. They are right next to the ice hockey arena, and we happened to be there on game night, so the atmosphere was incredible. It’s one of those places that local TV news goes to to get fan reactions without actually having to be at the game themselves. 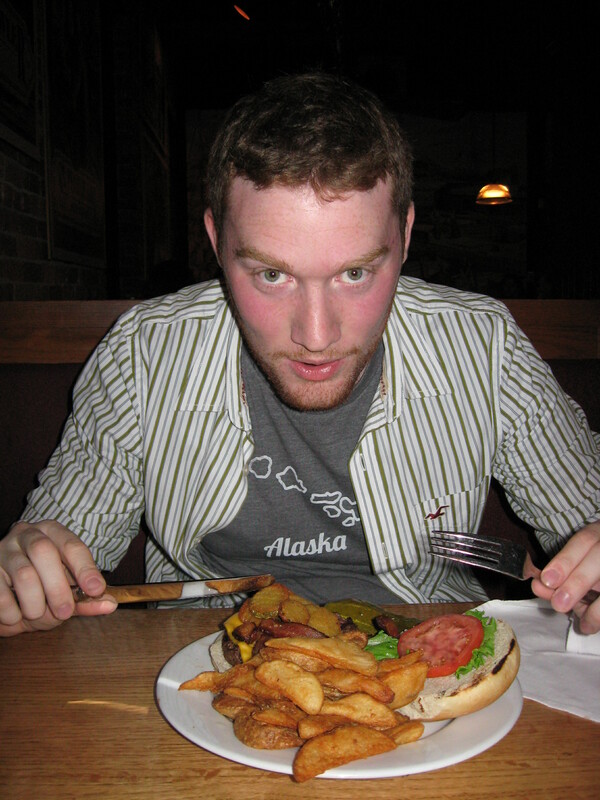 Below is a picture of the mighty burger that I somehow managed to eat while we were there. This was very much a burger with everything on. Bacon, cheese, gherkins, tomato, salad… It’s hard to analyse, because you spend most of the time eating it trying not to spill oil down yourself, or attempting to keep the burger in the bun (successful on both counts on this occasion). As you can tell, they’re big on chips here too. It’s just an absolute classic burger, plenty of proper meat. They take their food seriously over at Pearl Street, as they are also home to a deli. We were too late to sample anything from there, but we took full advantage of the on-site brewery, where they had a Draft Board with at least a DOZEN different home-made beers on it. Oh my goodness… Completely different styles of beer too. I had a Dark I.P.A., which I thought was impossible, as well as a stout, and my friend Charlie sampled the fruit beers, including blueberry and (I think) apricot. At the moment there are 8 different beers on tap, but I don’t recognise any of them. They must change a lot. So, Buffalo is a pretty special place for us. We explored some quirky neighbourhoods, and took ourselves off on a massive walking tour to see the sights. It’s really the food, though, that connects you to a place. I’ve blogged before about my love of Detroit, and a lot of that is down to the people and the food. Food is an everlasting memory – you always remember bad food – so when you find good food, or even great food, it can help you forge a special connection. 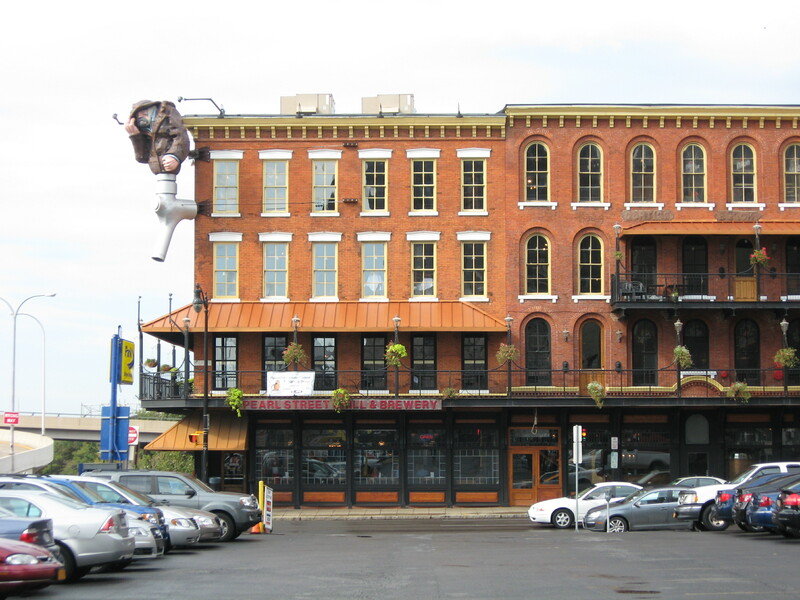 Despite all its problems, Buffalo is a city worth more attention. If (when) you go to Niagara Falls and maybe are planning on passing Buffalo by, just remember there are some amazing restaurants and sights in the city. It might change your idea of the place. Thanks for reading this far.